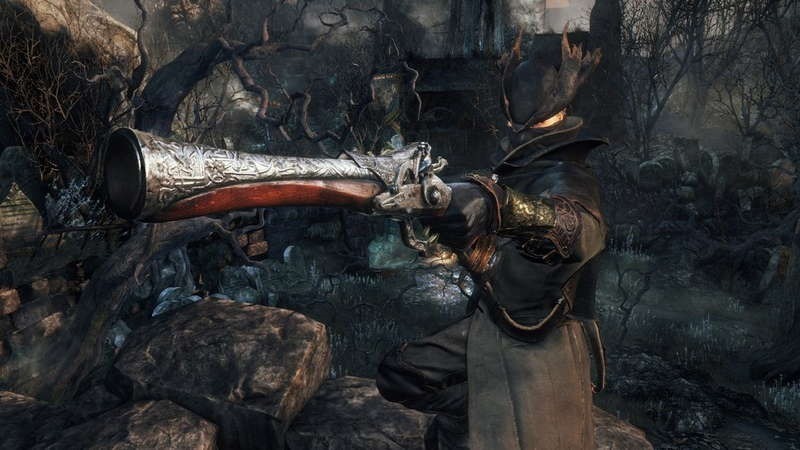 Bloodborne is a Souls game and that means it’s hard, incredibly hard. It’s brutal and unforgiving. It’s not immediately accessible and it all but requires players to really understand and learn the ins and outs of it. Patience and perseverance are mandatory requirements to play this game. 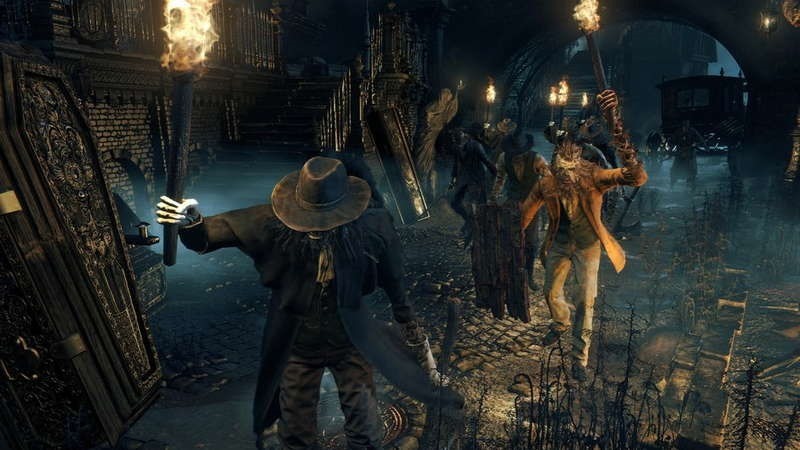 It might sound like a chore to play but Bloodborne is fair. Few other games treat you like you’re a sentient human being. If you’re open enough to it you will undoubtedly find a game that will grip you from start to finish and hold onto you long after it’s done. 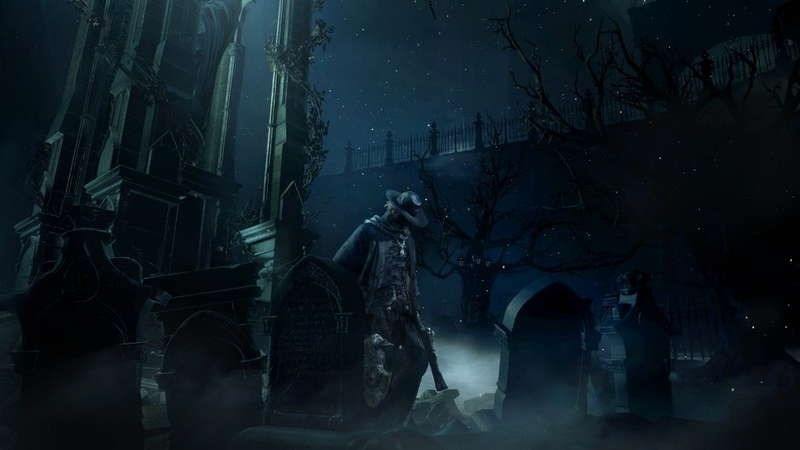 While it seems as though there might be no real story in Bloodborne apart from the player knowing that he or she is a hunter that needs to kill beasts, the truth of the matter is that just like everything else in the game, it’s all obfuscated. Those new to Souls games may have a hard time coming to grips with this type of storytelling, but once you start reading into things, talking to NPCs and examining items, you’ll start to slowly piece together just how twisted the world of Bloodborne really is. Take your time playing this game as the darkness runs deeper than you know and you’re going to want to dive head first into the misery to truly appreciate what is happening. 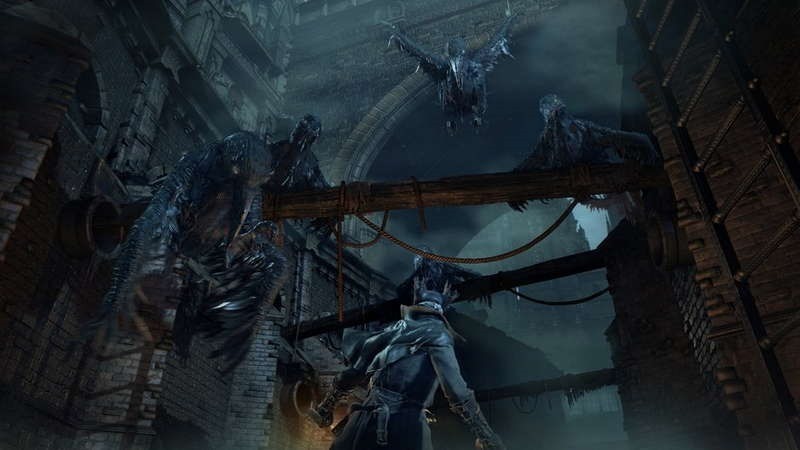 I was taken aback by some of the things I discovered in the town of Yharnam and Yarhar’gul by some of the NPCs and what is really great about it all is that they’re all optional and completely missable, making their discovery all the more meaningful. So unless you actually make an effort to figure out the story, you’ll never really know the truth. 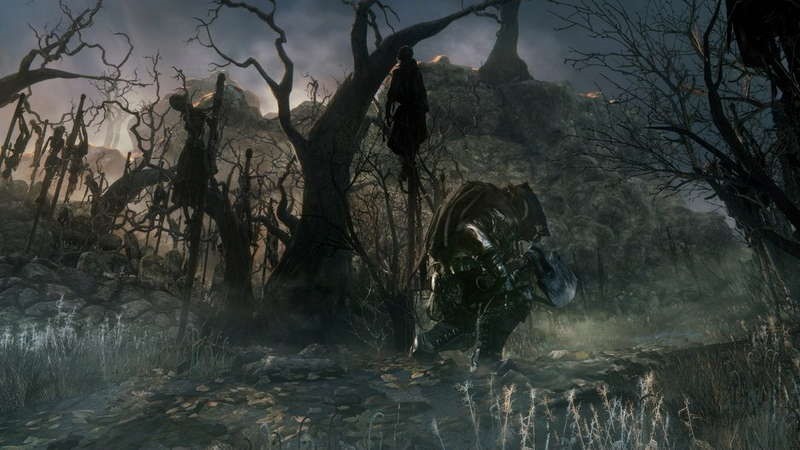 Gameplay in Bloodborne is unlike anything else featured in previous Souls games. The foundation feels somewhat similar, which might ease veterans into the game but it is by no means familiar. In previous titles, players were encouraged to play more cautiously, guarding one’s self with a shield and waiting for that perfect opportunity to strike. In Bloodborne however, the game nearly forces you to constantly be on the offensive, relying much more on reflexes and timing than careful planning. To complement this new style of gameplay, the controls and core mechanics have seen a major overhaul with rolling turning into zippy sidesteps when locked on, the shield being replaced with a stun-inducing gun and the introduction of morphing weapons called Trick Weapons to constantly change up your playstyle. There is even a new mechanic that allows you to recover lost health for a short period of time if you manage to retaliate and attack the enemy in time. Despite the faster nature of combat this time around, it still feels tight and responsive, more so than any game in the series. Sidestepping and zipping around the battlefield is extremely satisfying, but don’t get carried away though as every dodge and attack consumes stamina which recharges over time. Attacks are still broken down into light and heavy attacks with the heavy attack now being able to charge up for extra damage. While the combat and its combos are still pretty basic, it’s the weapon morphing that makes things interesting this time around. Every weapon has two forms and with the touch of a button you’re instantly able to switch between them at any time, even mid combo. For a large portion of my playthrough I used a weapon called the Threaded Cane. The cane acts as a normal sword that deals in fast if not weak attacks but changes into a blade-covered whip in its alternative form. Situational awareness is ever important in not only knowing where and how to move but also which form of your weapon you need to use. It’s a thoughtful process that requires you to think ahead while dealing with the current situation at hand and it leads to some of the most intense and nail-biting combat scenarios I have ever experienced – especially in the boss battles. There are not as many weapons to be found as there are in other Souls games but that doesn’t mean that customization lacks depth because of that. Every weapon feels much more fleshed out this time around and really leads to some interesting and varied playstyles. For instance, playing with the Stake Driver has you going in for some tense, close quarter combat which makes snappy decisions all the more important as opposed to one of the other weapons with more range. You’re also able to augment weapons with blood gems (given that you’ve increased their levels appropriately using bloodstone shards) that add an array of different modifiers and buffs. Then you have Runes which you can equip that grant different effects such as gaining more Blood Echoes as well as using temporary modifiers that adds an elemental effect to weapons. Character progression remains the same as in previous games. Souls have been replaced with Blood Echoes, which acts as a currency to not only level up your character but to also purchase items and weapons from the vendor. You can use them to increase individual stats in the hub world called Hunter’s Dream that not only affect your character’s overall abilities but also dictate which weapons you can use. Stat bonuses and weapon scaling is still present in this game too. Blood Echoes, like Souls, can also be lost should you die. They can be retrieved at the spot where you died but should you fall again, those Blood Echoes are lost forever. Online Functionality remains largely the same as before. Players are still able to leave notes for each other which are either incredibly useful or deceptively misleading, but it’s all part of the experience. Players are also able to summon others into their game to tackle one of the many baddies in Jolly cooperation. 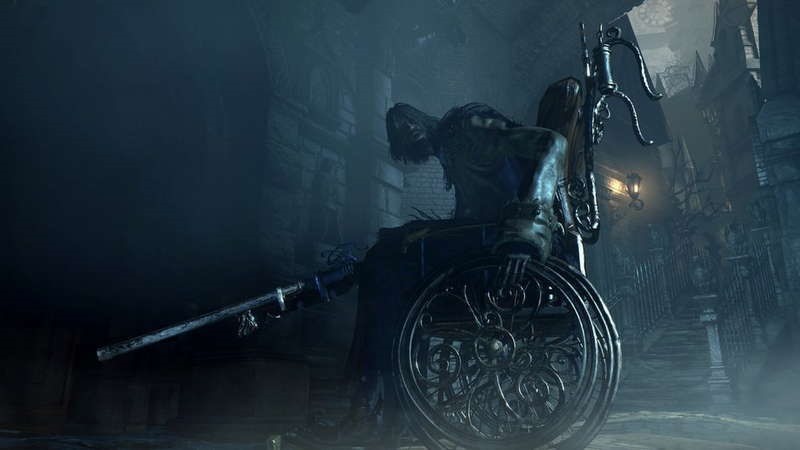 New to Bloodborne however is the presence of the Bell Maiden. When you start a co-op session a Bell Maiden spawns somewhere in your game that acts as a conduit which summons invaders into your world. This adds an incredible sort of strategy and risk to your session. Do you want to co-op at the risk of being invaded or do you want to hunt the Bell Maiden together with your partner before you get invaded or do you just all together take the plunge and fight off those invading your game? It’s an absolutely brilliant mechanic that really changes the nature of the game and online play. PVP is present and accounted for and it’s quite the beast; if you’re fighting a worthy opponent. At this point in time PVP is a bit unbalanced as it’s a bit of a slog to fight someone who constantly ends up healing themselves. It’s much easier to use a healing item this time around due to your nimble movement, so matches tend to be drawn out a bit. Though it may seem unfair, it’s up to you to put that pressure on your opponent and just like combat in the main game, you have to be aggressive – and once you start to charge forward more often, PVP becomes a blast. PVP, like co-op, relies on a finite resource called Insight which you’re able to replenish in a number of ways, so don’t worry too much about running out of it. 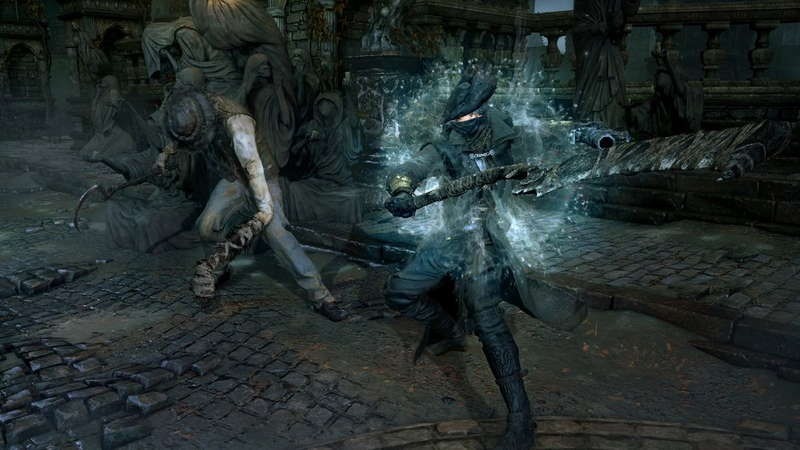 New to Bloodborne are special, procedurally -generated areas called Chalice dungeons. These are sort of challenge stages that you can tackle alone or with friends and offer a nice supplementary distraction when you want to take a break from the main game. These dungeons are rife with traps and incredibly aggressive enemies, so be careful when attempting to venture into these areas as they are by far some of the most challenging scenarios you’ll find in the game. Bloodborne is one of the most beautiful games on the PS4 right now. It might not be the most technically outstanding game that comes anywhere close to the looks of something like The Order 1886, but rather it’s the art style that sets it apart from so many games. The gothic and derelict look is so authentic and so fully realized that you’d you be hard pressed to find a similar game in style to rival it. The immersion is only intensified by the awesome sound direction. The distant ring of a clock tower or the subtle bustling of the wind instils a sense of beauty and wonder to the world while the disgusting roars and sharp cries of beasts makes you fearful to take another step forward. I clearly remember entering Yarhar’gul for the first time, something that left me utterly breathless. The gentle but intense music and scary environment just blended so well together to create an instantly memorable location. Unfortunately there are some occasional frame rate inconsistencies and loading times are extremely long, and while they are annoyances, I found them to do little to actually hamper the overall experience. While it’s certainly not for everyone, Bloodborne is amazing. It’s beautiful and brutal and it actually loves the player more than it lets on. It wants you to succeed. It wants you to keep getting better at the game. It wants you to explore the world and uncover all its secrets.